A lot of you who saw my announcement for the Marathon: Grendel project have probably been wondering what's been going on with it. I said I'd have a demo by Christmas 2012, but of course that never happened. Some of you probably think the project is dead. It's not. I have been working on it a bit over the last month, testing out some modified monsters (meant to be humans/Pfhor infected by some horrible fungus that takes over their nervous system) and working on some of the levels. I also decided to start over on the Color Tables, which is actually working quite well. I actually found the spot I got this pic from on accident, while running around to get pictures. You should probably be able to find the same spot in the full game, though I haven't decided whether you'll be able to stay there. EDIT: That area is now set to teleport you back up. I think I could still work on the texturing a bit here, but nevertheless, I think it looks pretty cool already. And yes, you can fall off the edge of the station from there. EDIT: I changed the polygon types so that falling off will kill you, and I also did a wee bit of retexturing. Hopefully some of the details will look better. And lastly, a nice view of that section of the station from another part of the level. Also, I did use two texture sets here: for the outside of the station, I used some of the Lava textures, and for the inside, I used the Water textures. The result actually looks kind of nice; it gives the inside a softer look, while the outside maintains a distinct, metallic, gritty appearance. - Tweak the story to be less random/more believable. And with that, I leave you to make your own judgments. Last edited by PerseusSpartacus on May 3rd '13, 00:05, edited 1 time in total. Well, I am always happy for new scenarios to try, and this does look interesting! I'm glad you're still working on it. Thanks. Glad you're interested. This project will take a lot more work, and I hope to find somebody who can make some terminal and chapter art for it. Nevertheless, I think I can do the main work myself. I even have a temporary main menu at the moment, as well as a menu theme (namely Nick Singer's version of 'Flowers in Heaven'). I may also look for beta testers at some point, and maybe even just physics testers (to test the monsters I create, who aren't really that hard to deal with, so long as you have a constant supply of 3x Health Canisters ). If you're interested, just let me know, and I'll ship some material your way. PerseusSpartacus wrote: Thanks. Glad you're interested. This project will take a lot more work, and I hope to find somebody who can make some terminal and chapter art for it. Nevertheless, I think I can do the main work myself. I even have a temporary main menu at the moment, as well as a menu theme (namely Nick Singer's version of 'Flowers in Heaven'). Excellent, I would be happy to be one of the beta testers! Wish I could help with the art bits, but my drawing skills are laughably rusty (and weren't much to write home about to begin with). SylithSenjak wrote: Excellent, I would be happy to be one of the beta testers! Wish I could help with the art bits, but my drawing skills are laughably rusty (and weren't much to write home about to begin with). Awesome. It'll be quite a while before I have anything ready for beta testing, though I could send you some physics models to mess around with (for testing monsters); that wouldn't take very long at all. Let me know if you're interested. Right now, I already have a physics model demonstrating the Infected and Possessed enemies, and I have yet to work on some physics models demonstrating the Spec-Ops and Elite Vanguard enemies. I doubt I could offer helpful advice on the physics models, so sadly I'll pass, but good luck! I'm definitely looking forward to beta-testing the scenario. SylithSenjak wrote: I doubt I could offer helpful advice on the physics models, so sadly I'll pass, but good luck! I'm definitely looking forward to beta-testing the scenario. Alright then, as soon as I get something close to a beta (which will probably be a long time), I'll ship it your way. Also, out of curiosity, how much do you (or, for that matter, does anyone) like Dream Levels? I'm particularly thinking of the Dream Levels in Rubicon X here. The reason I ask is because I'm debating myself on whether, for the sake of artistic fun, I should intersperse some Dream Levels throughout the game; I have some great textures for the job, but it helps to know how much people like such things before going around inserting them all throughout. I liked the ones in Rubicon all right, besides the vacuum one (I really don't care for vacuum levels), but one of the primary reasons I gave up on playing Eternal was the horrible fisheye effect on the dream levels and ends of failed timelines. So - avoid fisheye effects and vacuum and you're fine by me. I did read a couple of playthroughs by RyokoTK which were pretty dismissive of dream levels, though, so you'd probably want to use them sparingly. I think dream levels would be OK if they had some reasonable combat. Unforunately, most of them have either no combat, or combat that isn't very fun. The point of a dream level is to introduce something unusual or weird, something that spices up a mix of levels. Since most of time Marathon seems to be a slaughterfest, then when people make dream levels, they instinctively avoid the slaughterfest. But I still think it is possible to have the weirdness of a dream level while still having lots of action. I think the "dream level" idea may be, arguably, played out. But it does play a useful role as a kind of intermission separating blocks of regular, mainline story levels. Why not take it in a different direction, where your scenario offers similiar breaks in its own way? There should be various literary devices you could leverage... flashback, story within a story, changing protagonists, etc. The main reason I ask about dream levels is that I have a whole lot of textures here that I can imagine using in the context of a dream level. SylithSenjak wrote: liked the ones in Rubicon all right, besides the vacuum one (I really don't care for vacuum levels), but one of the primary reasons I gave up on playing Eternal was the horrible fisheye effect on the dream levels and ends of failed timelines. So - avoid fisheye effects and vacuum and you're fine by me. I did read a couple of playthroughs by RyokoTK which were pretty dismissive of dream levels, though, so you'd probably want to use them sparingly. Yeah, I don't like vacuum or fisheye effects either. I probably won't use either of them in my game anyways. And no, I don't intend to have half the game filled with dream levels; I'll use them sparingly. fiddler_on_a_roof wrote: The point of a dream level is to introduce something unusual or weird, something that spices up a mix of levels. Since most of time Marathon seems to be a slaughterfest, then when people make dream levels, they instinctively avoid the slaughterfest. But I still think it is possible to have the weirdness of a dream level while still having lots of action. Indeed. I'll think about the action-dream combination a bit, see what I come up with. Crater Creator wrote: I think the "dream level" idea may be, arguably, played out. But it does play a useful role as a kind of intermission separating blocks of regular, mainline story levels. Why not take it in a different direction, where your scenario offers similiar breaks in its own way? There should be various literary devices you could leverage... flashback, story within a story, changing protagonists, etc. I think my intention is to have these dream levels meant as foreboding warnings and hints at what is to come. For instance, mysterious terminals hinting at the appearance of the fungii-infected enemy, or visions of a downed human ship. Enemies that are not supposed to be infected, but rather just 'possessed' (aka infected by a computer virus) will still be grey, however, as the green theme doesn't quite make sense when it's just a computer virus. And yes, I made that logo. Finally, I've been adding some textures from the xmas_psds package on the Marathon: Orphanage (made by Shadowbreaker/Alex Marshall and Drictelt/Andreas Nuyts). They're really quite amazing, I must say. 1. Beta testers. I really just need people who can test the game on all different difficulty levels. I would prefer it if your preferred difficulty setting is Normal or higher, though I would assume most people here qualify for that. Also, if you beta-test it, I may just let you put a message into a secret terminal somewhere in the game! 2. Somebody to make some in-game music. This isn't really a necessity, as I can certainly wait till after the first release before finding somebody to make music. However, it would be nice if I knew someone was working on the music at the same time as I was making the actual content of the game. I'm really not that picky with the style (in other words you could go for the kind of stuff Johan Ganeteg made, or you could go with something more like Craig Hardgrove's remakes of the original Marathon soundtrack; I really don't care, so long as it sounds good), though I would recommend looking into the soundtrack from Marathon 2: Special Edition (and in particular the pieces by Cannibal Whore Feast and Mark Sumner, as well as MuShoo's 'We're Everywhere! '), which you can get here: http://www.themarathonmusic.com/music/other/M2_Tracks_MP3.zip. Also, try to be as diverse as possible with the music. There should be some dark, nail-biting pieces, as well as parts designed to make your heart thump. I'm sure I can find a good place to put every song you make. If you're interested, send me a sample of your work via PM and I'll let you know what I think. Time for some big updates. My project was originally going to be something along the lines of Marathon: Aeon; new maps, new textures, new music, modified monsters, and little else changed. However, I've found a friend of mine who's not only willing to do the music; she's also willing to create graphics for - *drum roll, please* - new weapons! So now Grendel is going to be something more along the lines of Marathon: Phoenix. To give you guys a hint at what you'll see, if you've ever wanted to have a Wave Motion Cannon in your hands, now your wish will be answered. Currently, I'm in the process of creating test versions of the weapons, and deciding what to replace the Pistols and Shotguns with. I've got the rest of the weapons, but I cannot figure out what to replace those two things with. If anybody has any suggestions, feel free to speak up. Now, this does kind of put maps on hold, as I want to finish work on the weapons before I start making any new levels (though I may finish up the ones I'm working on currently). Replace the pistols with other pistols that better. You always need pistols. Seriously, keep the shotguns. Unless you can somehow make a shotgun as ridiculously awesome as the original, just keep the original. When you are in the middle of a difficult part of the project, it is extremely tempting to take your mind off it and work on something easy. This is OK if you do it in a disciplined manner, i.e. commit to return to the difficult part after a fixed, short amount of time. But often we can get sidetracked too long with the easy stuff, the icing on the cake, the things that will amount to nothing unless we finish the difficult part. I see here that you have made title screen, worked on the plot, changed the color tables, worked on the weapons, but have not completed any maps. Do the maps. This is the heart of the matter, and unfortunately also the hardest part. craZboy557 wrote: Replace the pistols with other pistols that better. You always need pistols. It's settled, then. Shotguns stay, pistols get an upgrade. How I can make them better is a different question. Rubicon's Pistols were awesome, and once you got two of them in your hands, you had something like a semi-automatic machine gun. However, I don't want to duplicate Rubicon, and so I need something unique and original. Additional power, firing speed, or ammo is out of the question. It needs something brand new. What that'll be, I have utterly no clue, but I'm sure I'll find something. fiddler_on_a_roof wrote: When you are in the middle of a difficult part of the project, it is extremely tempting to take your mind off it and work on something easy. This is OK if you do it in a disciplined manner, i.e. commit to return to the difficult part after a fixed, short amount of time. But often we can get sidetracked too long with the easy stuff, the icing on the cake, the things that will amount to nothing unless we finish the difficult part. I know. Right now I'm working on a map, but I'm not sure it'll be that great; the main issue is that I've realized I lack the right textures for underground rock. It just looks weird. Hopefully I can just finish it and move on to levels I know I can do right. Maybe the pistols could have splash damage? Maybe they could jump between enemies? 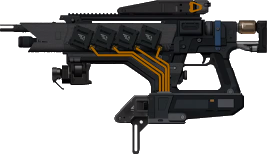 Maybe make the new pistols fire 3 or 5 weak shots simultaneously, with a theta error of 0 and the bullet set to horizontal and vertical wander. Perhaps 6 bursts per clip. Sort of "shot pistols" with a tight spread, Although it does seem a bit gimmicky when I think about it. craZboy557 wrote: Maybe the pistols could have splash damage? b) Some sort of energy gun, but I don't like that idea either. craZboy557 wrote: Maybe they could jump between enemies? I presume you're referring to the Persistent and Virulent function, which allows a projectile to pass through all monsters until it hits a wall. The problem with this is that whenever I fire into an enemy that's right in front of me, it damages me as well, for some inexplicable reason. So unless there's some nice way of explaining how it can go through an enemy and hurt me if I'm too close without hurting me if I'm just shooting into a wall or hurting anything that's standing just to the side of where the projectile hits, I'm not seeing that as a reliable option. Which is a shame, because it's such a great idea having projectiles pass through enemies. Yeah, I would hope to keep dual-wielding, and I also don't like the idea of emptying an entire clip in a split second. Kinda makes normal fire useless. The closest thing I can think of is an automatic weapon (such as the Assault Rifle) having a secondary fire that makes it more accurate but slower-firing, sort of like a semi-automatic setting, but that's not relevant here because I don't want to have Machine Pistols or whatever as the replacement for the Pistols, given that that's been done before in a scenario I actually really love (namely Marathon: Phoenix). General Tacticus wrote: Maybe make the new pistols fire 3 or 5 weak shots simultaneously, with a theta error of 0 and the bullet set to horizontal and vertical wander. Perhaps 6 bursts per clip. Yeah, I don't really like that idea. I do find that the wander thing might be fun to use somewhere in the game, but I'm not sure it would feel quite right in this particular instance. Seems to make more sense with something you can actually see, like some alien attack. Take fiddler's advice to heart. For one example, it often works to let an artist do her thing, and let the function come after the form. It may be surprising, but you can decide what a weapon should do after the art is made, especially in a science fiction realm, and not be the worse for it. Just give her the direction of 'something to replace the pistols, probably still dual-wielded' and while you wait to see what she comes up with you can be working on the maps. Are the weapons going to be High-res, or are you going to stick to the basic shape files? It would be nice to see a new scenario with good weapon graphics. Crater Creator wrote: Take fiddler's advice to heart. For one example, it often works to let an artist do her thing, and let the function come after the form. It may be surprising, but you can decide what a weapon should do after the art is made, especially in a science fiction realm, and not be the worse for it. Just give her the direction of 'something to replace the pistols, probably still dual-wielded' and while you wait to see what she comes up with you can be working on the maps. I don't think that's how it's gonna work. The way I think she and I wanna do it is I design the weapons, tell her what the weapons are gonna be, throw a bit of inspiration her way, and let her go from there. General Tacticus wrote: Are the weapons going to be High-res, or are you going to stick to the basic shape files? It would be nice to see a new scenario with good weapon graphics. I would assume basic shape files, but I can't be sure yet. It may be that the early versions have basic shape files, and later releases will introduce stuff like high-res graphics. I think I may at some point introduce fun stuff like glowmaps (which I can probably do myself). Y'know, originaly, the Wraith was just concept art. They had an alien tank but they didn't know how it would work. But they looked at the concept art decided that it sorta looked like it would lob mortars, and decided to go with that. If you're having trouble with ideas, just throw down some concept art and just think about what it looks like it would do. craZboy557 wrote: Y'know, originaly, the Wraith was just concept art. They had an alien tank but they didn't know how it would work. But they looked at the concept art decided that it sorta looked like it would lob mortars, and decided to go with that. Interesting idea. I guess my sketching skills may be of some use after all. I'll try and throw down a few random ideas and see what pops into my head. Maybe I'll find something useful.